I can remember one day when Aiden was about three and he was not cooperating when we were shopping. I said that if he didn't behave I'd return something we had already bought at a previous store and Paul looked at me and said, "Are you really going to do that?" Of course, Paul knew that I had no intention of going back to that other store, so my threat was an empty one. Empty threats are easy to make as a parent, but they rarely work. Kids figure out really quickly that we won't actually follow through with those consequences we're threatening and then our words mean nothing. There's no incentive for them to do what we're telling them to do because they know there will be no consequence if they don't. After Paul called me out in the store that day, I became much more careful about only threatening real consequences that I would actually follow through on. Not that I was perfect at it, but I certainly tried. I also became aware of just how often parents use empty threats and how often they elicit no reaction whatsoever from the kids. Kids are smarter than we give them credit for! We talk a lot in church circles about God keeping His promises and usually we're talking about the good things He has promised us. Things like salvation (John 3:16), a home with Him for eternity (John 14:3), an eternity free of sickness, pain and death (Revelation 21:4). Wonderful things, and wonderful promises. But there are also consequences spelled out in the Bible. The most important one is "For the wages of sin is death" (Romans 6:23). Since "everyone has sinned; we all fall short of God’s glorious standard" (Romans 3:23), which means everyone's earned wage is death. Thankfully that first verse continues, "but the free gift of God is eternal life through Christ Jesus our Lord" (Romans 6:23). So there is a consequence spelled out (death), but also the way to avoid the consequence (believing in Jesus). "Not everyone who calls out to me, ‘Lord! Lord!’ will enter the Kingdom of Heaven. Only those who actually do the will of my Father in heaven will enter. On judgment day many will say to me, ‘Lord! Lord! We prophesied in your name and cast out demons in your name and performed many miracles in your name.’ But I will reply, ‘I never knew you. Get away from me, you who break God’s laws.’ "(Matthew 7:21-23). This one might seem confusing, but it means that those who merely say they follow Jesus, without having any actual faith in Him, will not enter heaven. These verses are about those who say they believe, maybe because they think it's what others want to hear or because it is what is expected of them, while in truth they actually don't believe. "I am the way, the truth, and the life. No one can come to the Father except through me" (John 14:6). Those who refuse to have faith in Jesus will find one day that there is no other option that God will accept. Just as with a parent, God does not want to have to follow through with the consequences. 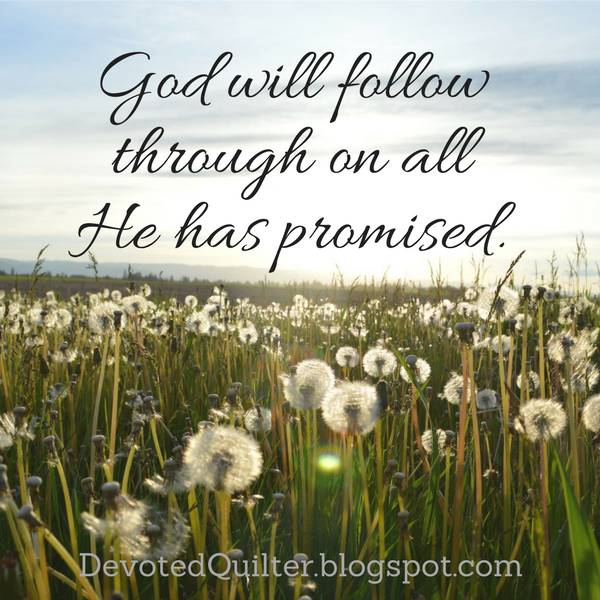 "The Lord isn’t really being slow about his promise, as some people think. No, he is being patient for your sake. He does not want anyone to be destroyed, but wants everyone to repent" (2 Peter 3:9). He has shown us the consequences along with the clear path for everyone to follow to avoid those consequences precisely because He longs for us all to take the path of faith. He does not want to lose even one person, which is why salvation requires nothing of us except belief. "God saved you by his grace when you believed. And you can’t take credit for this; it is a gift from God. Salvation is not a reward for the good things we have done, so none of us can boast about it" (Ephesians 2:8,9). I love knowing that God keeps His promises. There is comfort in knowing that He means what He has said to us. Of course, that also means that the consequences He has presented are not empty threats.